The FTS series has been discontinued. Please contact our Temperature Engineering department for a viable replacement. 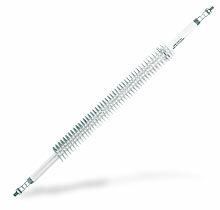 Finned tubular air heating elements are constructed like basic tubular elements with the addition of continuous spiral fins, 4-5 per inch permanently furnace brazed to the sheath.Fins greatly increase surface area and permit faster hear transfer to air, resulting in lower surface element temperatures. 0.80 cm (0.315") Sheath Diameter (D) Approximately 60 W/sq. in. * The overall length of A will be slightly less than one-half the original sheath length, depending on bending radius. ** The overall length of A will be approximately 3.8 cm (11/2") longer than one-fourth of the original sheath length depending on the bending radius R. Note: the start of any bends should be no closer than 8.7 cm (37/16") for 1.2 cm (0.475") dia. or 9.2 cm (35/8") for 0.8 cm (0.315") elements, from the end of the sheath to prevent the heating element/cold pin junction from being located in the bend. 참고: Other heaters with monel sheath [max. temp. 565°C (1050°F)] are available. Contact OMEGALUX™ at 1-800-826-6342.